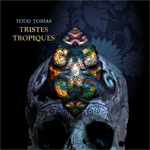 Release info (from Todd Tobias): A dreamy, hypnotic, melancholy-soaked collection evoking far-flung places where small-scale societies and indigenous cultures have vanished or are in the process of being swallowed by an ever-expanding global civilization. "Tristes Tropiques" from the title of the book by French Anthropologist Claude Levi Strauss. The literal translation is "Sad Tropics." The English version of the title is "World On The Wane," referring to the vanishing culture-worlds of the last remaining small-scale societies on Earth. The album is not inspired directly by the book, I simply borrowed the title.